Auch a pretty card Benny, a lovely design with a beautiful created a gorgeous background, your yeart is beautiful with super details!! Thanks so much for goining us with <a href="http://www.simonsaysstampblog.com/wednesdaychallenge/'.Simon Says Stam Wednesday Challenge</a>. Very pretty!! That die is so elegant; just perfect for a wedding card. Thanks for playing with Jo's Scrap Shack. Awesome heart card, so happy you shared it with us at our Cre8tive Hand Friends Challenge. Lovely card!! Thank you for sharing it with us on Cre8tive Hands Friends. A GOrgeous design and such pretty dies. Thank you so much for joining us this week at QKR Stampede. Beautiful card Bunny! Love the dies and papers! Thanks for joining our challenge this week at QKR Stampede! So very pretty. Great die cut heart. Thanks for joining us at A Beautiful Mess for this challenge. Beautiful card! 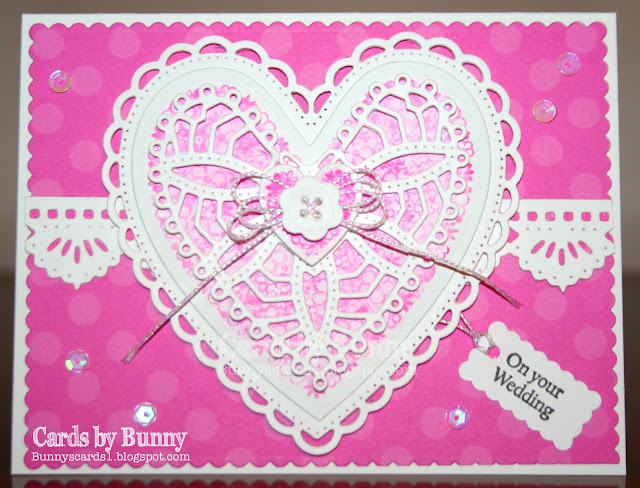 Love that pretty die cut heart!! Such a bright, cheery card Bunny!! I love all your pink and that beautiful dp behind your heart! Thanks for sharing your creation by joining the ODBD Shining the Light Challenge this week! This is so beautiful with that elegant die-cut heart. Great job! So delighted you linked your creation with us at Word Art Wednesday. I hope you join us again in our ongoing Challenge. I would love to encourage you with God's Word from 1 John 2:17 which says, "The world and its desires pass away, but whoever does the will of God lives forever." Have a wonderful week and God bless!